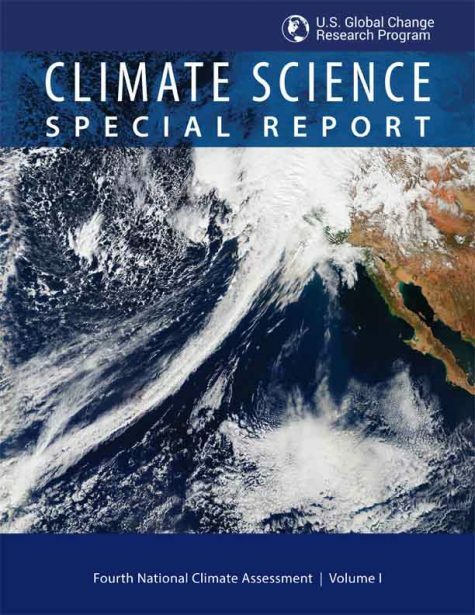 The Special Climate Science Report of the National Climate Assessment has been released uncensored. The message from fourteen national agencies, programs, departments and institutes, and the National Science Foundation and Smithsonian Institution: It is warmer than it has been in thousands of years. Carbon dioxide is higher than it has been in million of years. Impacts are happening faster and more strongly than anticipated. And, they quote: “There is a significant possibility for unanticipated changes.” This final statement has critical meaning for our global civilization that is further explained in the words of the report below. This appears to be one of the most meaningful climate assessments to date. At 477 pages though, it is a bit overwhelming. The Executive Summary at 22 pages does a good job and is a great 20 minute read to really get a feel for the state of the science today. A much shorter and more readable review–illustrated and annotated–that includes the most important bits of the Executive Summary, is presented below. While the report is still a consensus work that understate, is years behind, and relates fact in confusingly precise scientific jargon, it’s impact is substantially greater than any previous report. the expected continuation of increasing temperatures, including more record-setting extremes. The global, long-term, and unambiguous warming trend has continued during recent years. Since the last National Climate Assessment was published, 2014 became the warmest year on record globally; 2015 surpassed 2014 by a wide margin; and 2016 surpassed 2015. Sixteen of the warmest years on record for the globe occurred in the last 17 years. Global annual average temperature has increased by more than 1.2°F (0.65°C) for the period 1986–2016; and 1.8°F (1.0°C) from 1901–2016. Average temperatures in recent decades over much of the world have risen faster during this time period than at any time in the past 1,700 years or more. Many lines of evidence demonstrate that it is extremely likely that human influence has been the dominant cause of the observed warming. The likely human contribution is 92%–123% of the observed 1951–2010 change. [In other words, it’s likely that more than all of observed warming has been caused by humans — see here.] The global influence of natural variability, however, is limited to a small fraction of observed climate trends over decades. Annual average temperature over the contiguous United States is projected to rise. Increases of about 2.5°F (1.4°C) are projected for the period 2021–2050 in all RCP scenarios, implying recent record-setting years may be “common” in the next few decades. Much larger rises are predicted later in the century. There have been marked changes in temperature extremes across the contiguous United States. 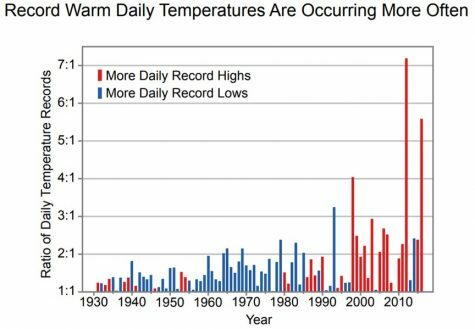 The number of high temperature records set in the past two decades far exceeds the number of low temperature records. Recent droughts and associated heat waves have reached record intensity in some regions of the United States. Northern Hemisphere spring snow cover extent, North America maximum snow depth, snow water equivalent in the western United States, and extreme snowfall years in the southern and western United States have all declined, while extreme snowfall years in parts of the northern United States have increased. There has been a trend toward earlier snowmelt and a decrease in snowstorm frequency on the southern margins of climatologically snowy areas. Winter storm tracks have shifted northward since 1950s. Potential linkages between the frequency and intensity of severe winter storms in the United States and accelerated warming in the Arctic have been postulated. Tornado activity in the United States has become more variable, particularly over the 2000s, with a decrease in the number of days per year with tornadoes and an increase in the number of tornadoes on these days. Confidence in past trends for hail and severe thunderstorm winds is low. Extreme temperatures in the contiguous United States are projected to increase even more than average temperatures (very high confidence). 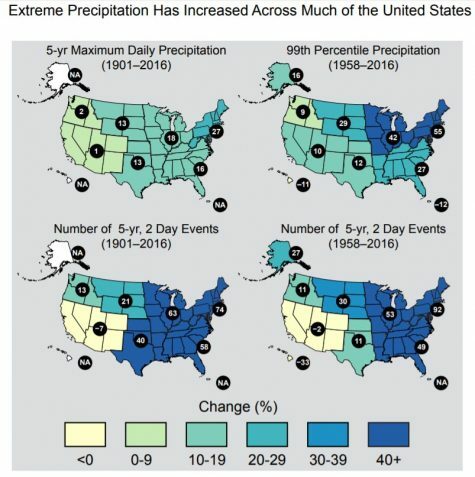 Projections indicate large declines in snowpack in the western United States and shifts to more precipitation falling as rain than snow in the cold season in many parts of the central and eastern United States. Substantial reductions in western U.S. winter and spring snowpack are projected as the climate warms. The world’s oceans have absorbed about 93% of the excess heat caused by greenhouse gas warming since the mid-20th century, making them warmer and altering global and regional climate feedbacks. Ocean heat content has increased at all depths since the 1960s and surface waters have warmed by about 1.3° F (0.7° C) per century globally since 1900 to 2016. Global mean sea level (GMSL) has risen by about 7–8 inches (about 16–21 cm) since 1900, with about 3 of those inches (about 7 cm) occurring since 1993. Human-caused climate change has made a substantial contribution to GMSL rise since 1900, contributing to a rate of rise that is greater than during any preceding century in at least 2,800 years. Emerging science regarding Antarctic ice sheet stability suggests that, for higher scenarios, a GMSL rise exceeding 8 feet (2.4 m) by 2100 is physically possible. 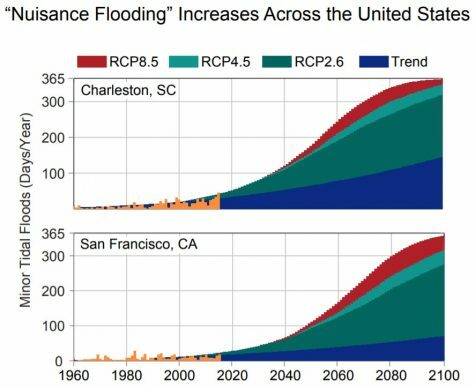 When nuisance flooding reaches a level 25 times greater than normal for the 20th century, NOAA says coastal resource abandonment will begin. The world’s oceans are currently absorbing more than a quarter of the CO2 emitted to the atmosphere annually from human activities, making them more acidic, with potential detrimental impacts to marine ecosystems. The rate of acidification is unparalleled in at least the past 66 million years. Annual average near-surface air temperatures across Alaska and the Arctic have increased over the last 50 years at a rate more than twice as fast as the global average temperature. Rising Alaskan permafrost temperatures are causing permafrost to thaw and become more discontinuous; this process releases additional carbon dioxide and methane resulting in additional warming. It is virtually certain that Alaska glaciers have lost mass over the last 50 years, with each year since 1984. Over the satellite record, average ice mass loss from Greenland was −269 Gt per year between April 2002 and April 2016, accelerating in recent years. Arctic Sea ice loss since the early 1980s has decreased in extent between 3.5% and 4.1% per decade; has become thinner by between 4.3 and 7.5 feet, and is melting at least 15 more days each year. September sea ice extent has decreased between 10.7% and 15.9% per decade. 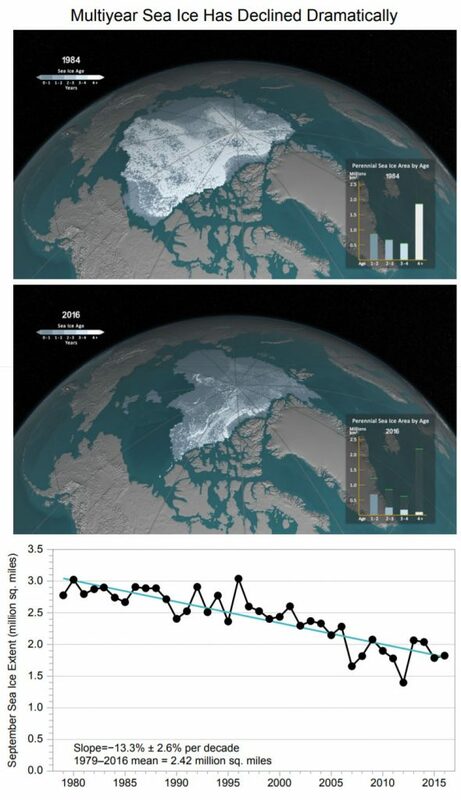 warming, sea ice loss, glacier mass loss, and northern hemisphere snow extent decline. Arctic Sea Ice, National Climate Assessment 2017. The observed increase in global carbon emissions over the past 15–20 years has been consistent with higher scenarios. In 2014 and 2015, emission growth rates slowed as economic growth became less carbon-intensive. Even if this lowing trend continues, however, it is not yet at a rate that would limit the increase in the global average temperature to well below 3.6°F (2°C) above preindustrial levels. Global mean atmospheric carbon dioxide (CO2) concentration has now passed 400 ppm, a level that last occurred about 3 million years ago, when global average temperature and sea level were significantly higher than today. Continued growth in CO2 emissions over this century and beyond would lead to an atmospheric concentration not experienced in tens of millions of years. 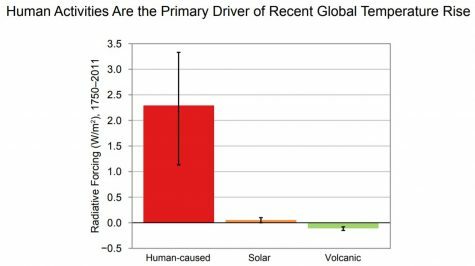 The present-day emissions rate of nearly 10 GtC per year [gigatons of carbon, or about 40 gigatons of CO2,] suggests that there is no climate analog for this century any time in at least the last 50 million years. Stabilizing global mean temperature to less than 3.6°F (2°C) above preindustrial levels requires substantial reductions in net global CO2 emissions prior to 2040, and likely requires net emissions to become zero or possibly negative later in the century. Achieving global greenhouse gas emissions reductions before 2030 consistent with targets and actions announced by governments in the lead up to the 2015 Paris climate conference would hold open the possibility of meeting the long-term temperature goal of limiting global warming to 3.6°F (2°C) above preindustrial levels, whereas there would be virtually no chance if net global emissions followed a pathway well above those implied by country announcements. Actions in the announcements are, by themselves, insufficient to meet a 3.6°F (2°C) goal; the likelihood of achieving that depends strongly on the magnitude of global emissions reductions after 2030. Humanity’s effect on the Earth system, through the large-scale combustion of fossil fuels and widespread deforestation and the resulting release of carbon dioxide (CO2) into the atmosphere, as well as through emissions of other greenhouse gases is unprecedented. There is significant potential for humanity’s effect on the planet to result in unanticipated surprises and a broad consensus that the further and faster the Earth system is pushed towards warming, the greater the risk of such surprises. There are at least two types of potential surprises: compound events, where multiple extreme climate events occur simultaneously or sequentially (creating greater overall impact), and critical threshold or tipping point events, where some threshold is crossed in the climate system (that leads to large impacts). The probability of such surprises—some of which may be abrupt and/or irreversible—as well as other more predictable but difficult-to-manage impacts, increases as the influence of human activities on the climate system increases. Positive feedbacks (self-reinforcing cycles) within the climate system have the potential to accelerate human-induced climate change and even shift the Earth’s climate system, in part or in whole, into new states that are very different from those experienced in the recent past (for example, ones with greatly diminished ice sheets or different large-scale patterns of atmosphere or ocean circulation). Some feedbacks and potential state shifts can be modeled and quantified; others can be modeled or identified but not quantified; and some are probably still unknown. The physical and socioeconomic impacts of compound extreme events (such as simultaneous heat and drought, wildfires associated with hot and dry conditions, or flooding associated with high precipitation on top of snow or waterlogged ground) can be greater than the sum of the parts (very high confidence). Few analyses consider the spatial or temporal correlation between extreme events. While climate models incorporate important climate processes that can be well quantified, they do not include all of the processes that can contribute to feedbacks, compound extreme events, and abrupt and/or irreversible changes. For this reason, future changes outside the range projected by climate models cannot be ruled out (very high confidence). Moreover, the systematic tendency of climate models to underestimate temperature change during warm paleoclimates suggests that climate models are more likely to underestimate than to overestimate the amount of long-term future change.